uuid : f9e8b6ce-2d76-4a6f-ab37-55c7b77ca3fe templates_id: 119497 templates_uuid: "08f7f9f7-5b9f-4628-977b-bea4ad4fa03b" title: "Dismissal for Redundancy Letter - Letter Confirming Redundancy" display_name: "Dismissal for redundancy letter" meta_keywords: "Redundancy termination letter and Letter confirming redundancy" description: "
Confirm selection for redundancy using this dismissal for redundancy letter. This redundancy notice covers the employee\'s dismissal arrangements including garden leave or payment in lieu of notice, final salary and holiday accrual. It also covers any outstanding points in relation to the dismissal, the amount of statutory redundancy compensation to be paid (if any) and the appeal process. What is a dismissal for redundancy letter? A dismissal letter for redundancy confirms the dismissal of an employee on the grounds of redundancy. It sets out the employee\302\222s dismissal arrangements, final salary, holiday accrual and any outstanding points in relation to the dismissal, the amount of statutory redundancy compensation to be paid and the appeal process. When do I need a letter for redundancy dismissal? You need this letter when you want to dismiss someone on the grounds of redundancy. 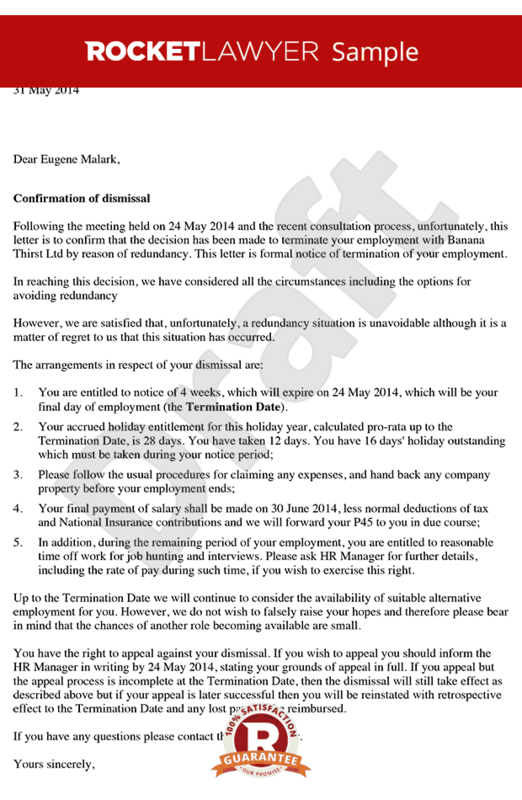 What processes must be followed before issuing this redundancy dismissal letter? For further information read Redundancy pooling and selection. If you are unsure whether you followed the correct procedures, Ask a lawyer. Why do you need to consider the likelihood of suitable alternative employment for the employee? The redundancy of an employee may be deemed unfair if the employer has not considered other less drastic solutions at work, eg. offering alternative employment to potentially redundant employees where it would be reasonable. This letter is governed by the law of England and Wales. \r\n" created_timestamp: "2018-10-08 04:36:25.0" modified_timestamp: "2018-10-08 04:36:25.0" active: true created_by: 236 modified_by: 236 dcm_id: 315 url_slug: "Dismissal-for-redundancy-letter" meta_description: "Create a dismissal for redundancy letter with step-by-step guidance from Rocket Lawyer. Confirm selection for redundancy to an employee. " time_to_complete: "10 minutes"
Confirm selection for redundancy using this dismissal for redundancy letter. This redundancy notice covers the employee's dismissal arrangements including garden leave or payment in lieu of notice, final salary and holiday accrual. It also covers any outstanding points in relation to the dismissal, the amount of statutory redundancy compensation to be paid (if any) and the appeal process. A dismissal letter for redundancy confirms the dismissal of an employee on the grounds of redundancy. It sets out the employees dismissal arrangements, final salary, holiday accrual and any outstanding points in relation to the dismissal, the amount of statutory redundancy compensation to be paid and the appeal process. More than just a Dismissal for redundancy letter template, our step-by-step interview and guidance makes it easy to create your document. Easily create online, download, print and sign your free Dismissal for redundancy letter in minutes. This document is also sometimes called: Redundancy termination letter and Letter confirming redundancy.